You know when you’re posting a really great photo to Instagram and there’s that tempting little button that beckons you to also share it on Facebook and Twitter? You think, “Yes, this is going to save me so much time!” While it may save you some time, it’s a dangerous short-cut that may cost you in the long run. Social media is a marathon, not a sprint. Just like with running a marathon, you need to be prepared and have a strategy in place if you expect to finish. Auto-posting is like failing to prepare for a marathon, and then expecting to be able to keep up with the other runners. You can’t just create a quick post on Facebook, auto-post it to your other sites, and think your job is successfully done. It’s not. If you want to reach your customers and actually engage with them in a way that creates loyalty (think: repeat customers), your social media needs to not only have a strategy, but a consistent implementation of that strategy. 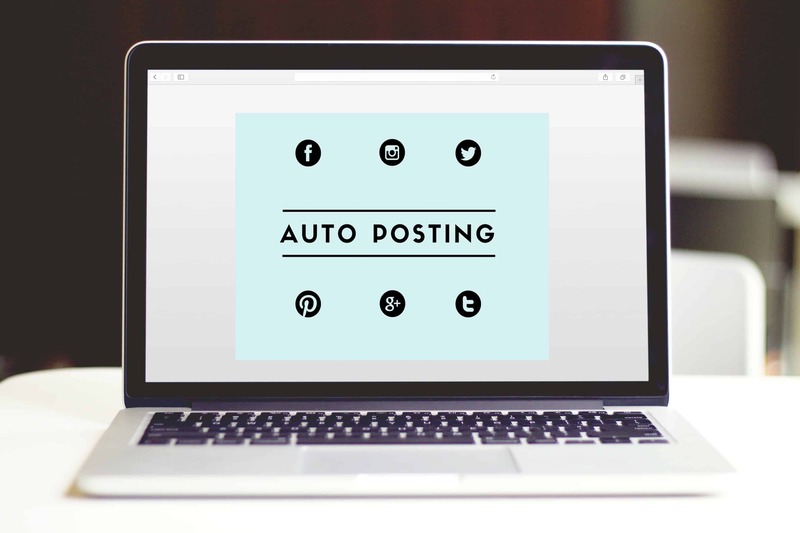 Below, I’ve outlined 4 major reasons you should to reconsider auto-posting on your social media. 1. Content should be platform specific. You don’t want your social media to look like a robot is posting instead of an actual human being, right? Of course not. Each social media site is unique, and you’re not doing your social presence or your restaurant justice by simply auto-posting from one platform to another. Not to mention, it’s unbelievably obvious when someone auto-posts, because the posts often don’t translate well across multiple social media platforms. For example, this business linked their Facebook page to Twitter, thereby triggering every Facebook post to be simultaneously posted to Twitter. You’ll notice a repetitive string of Facebook links that look totally spammy, and you can’t see the photos unless you click to another page, which is annoying. This business has also missed a huge opportunity to use relevant hashtags (a.k.a opportunities to be seen by more people), but most importantly, no one is engaging with this content, which makes sense because there’s really nothing to engage with. 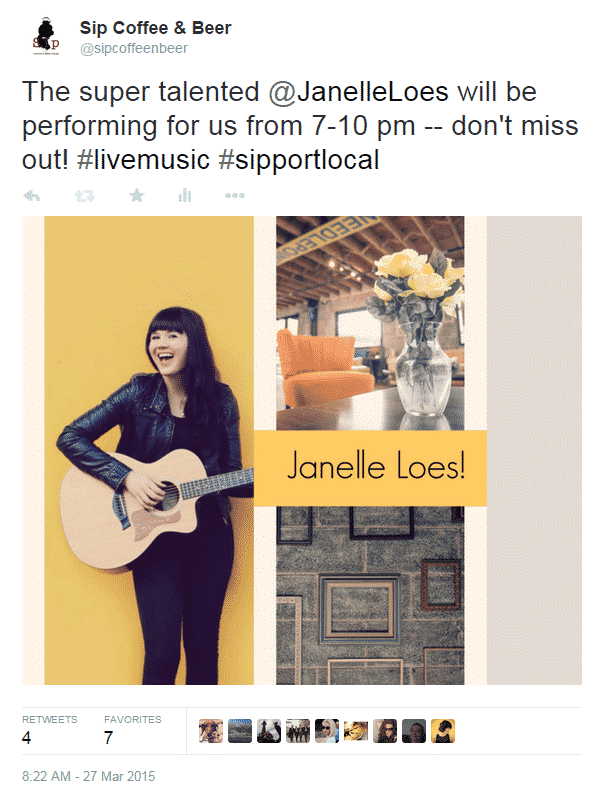 In contrast, here’s a great Twitter post from a coffee shop about a local show. It showcases an interesting image you can see within the platform, it tags the musician involved, and uses relevant, branded hashtags. 2. Mistakes are bound to happen. The solution? Properly tailor your posts by making sure the content you’re creating is unique to each platform. That’s not to say you can’t share the same general idea on multiple sites, but it’s important to make sure that you format the text properly, use proper hashtags, or better yet, share the content you’re posting from a different angle to keep things interesting. 3. You sound like a broken record. To put it simply, your customers are going to get bored if you’re regularly posting the same exact thing on each social media platform. You may wonder why you should care if your customers are following you on every social media site. Well, people are on social media all day long (no, really), so having a full social media presence is crucial to staying in touch with your customer’s needs. If your social media pages are all the same, your customers won’t have a reason to follow you on more than one, and in fact, they might be provoked to ignore your business altogether. 4. You fail at customer service. People don’t want to be talked at; they want to feel like they’re being talked with. 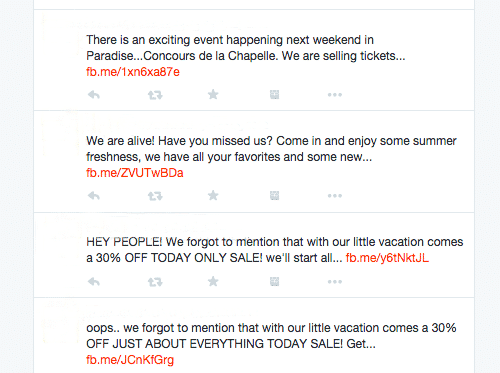 Burdening your customers with cumbersome links and repetitive content is not conversational. Having uniquely tailored content to each social media platform is critical to showcasing your restaurant’s sense of humanity. A study by Bain & Company shows that when companies engage and respond to customer service requests over social media, those customers spend 20% to 40% more with that company. That’s a lot to be gained by simply extending good customer service online. The act of logging into each platform encourages you to regularly pay attention and engage with what your customers are saying about your business. In the same way your servers check on tables to see if in-house guests are satisfied, someone needs to be checking social media to ensure guests online are satisfied. Extending customer service online isn’t just the right thing to do for your customers, it also makes good business sense. In fact, 71% of customers who experience positive social care (i.e., a quick and effective business response) are likely to recommend that business to others, compared to just 19% of customers who do not receive any response. 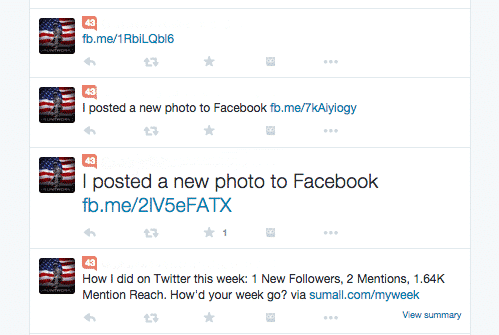 So while auto-posting might seem like an easy option, it’s simply not a solid social media plan. Engaging your patrons with good social media is one of the best ways you can strengthen and build relationships, and remind them why they should be a loyal customer. The bottom line is this: a solid social media plan needs to include relevant, thoughtful, and platform-specific content. 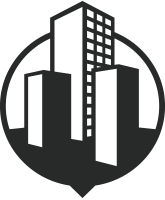 When this is executed correctly, you can expect better engagement and closer ties to your customers. My advice? Really think twice before auto-posting.